Entrepreneurship has the power to change the world. Incredible people create a better world with grit, determination and inspiration. PayU’s culture is entrepreneurial. We are always excited to partner with teams who share a similar vision. Celebrate the Intl. Women’s Day 2016 enabling women entrepreneurs! 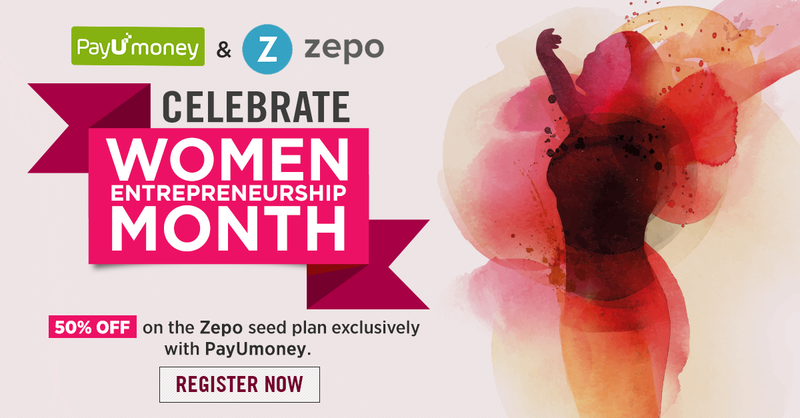 Zepo and PayUmoney have partnered to make it incredibly easy for women entrepreneurs to start-up. Women entrepreneurs who are running with the audacious mission of establishing a passionate following for their art and creativity online can start their e-commerce store on Zepo. Team Zepo will provide a 50% discount on their seed plan exclusively powered by PayUmoney. What’s more? We are constantly looking forward to empowering and stand by the woman of the nation and the world, one step at a time! To avail this offer, click here and share a few details on this form! We look forward to getting inspired by thousands of women entrepreneurs. This is a small beginning which will lead to an incredible India! With all the marketing efforts, it is a good idea to have a one-in-all payments service provider for your business. Grow your business with PayUmoney!